Alumni in Class of 1908 H.S. We currently have found 74 members of the BYH Class of 1908, based on the research of Scott Cowley in the BYU Records Office. The list appears to include all of the high school departments, including Commercial, Agriculture, Music, Normal, and High School Academic. We have found another handful of grads or honorary grads from various sources. BYH Class of 1908. Pearl Allen, a Normal graduate. BYU [& BYH] Class of 1908 Listing of BYH Normal, High School, Commercial, Music, Agriculture, and Arts & Trades graduates. Source: Brigham Young University & Normal Training School, Catalogue & Announcements, for 33rd Academic Year, 1908-1909, pp. 128-130. Brigham Young High School, Class of 1908. Rodney Allred. He received an Agriculture Diploma. Source 1: Students Record of Class Standings B.Y. Academy, Book 2, Page 220. ~ ~ ~ ~ Source 2: Rodney C. Allred. 1908 BYH Commencement Program. Brigham Young High School, Class of 1908. Andrew P. Anderson. He received a Normal Diploma. Source 1: Students Record of Class Standings B.Y. Academy, Book 2, Page 221. ~ ~ ~ ~ Source 2: Andrew P. Anderson. 1908 BYH Commencement Program. ~ ~ ~ ~ BYH Class of 1908. A. P. Anderson, a Normal graduate. BYU [& BYH] Class of 1908 Listing of BYH Normal, High School, Commercial, Music, Agriculture, and Arts & Trades graduates. Source: Brigham Young University & Normal Training School, Catalogue & Announcements, for 33rd Academic Year, 1908-1909, pp. 128-130. BYH Class of 1908. J. F. Anderson, a Normal graduate. BYU [& BYH] Class of 1908 Listing of BYH Normal, High School, Commercial, Music, Agriculture, and Arts & Trades graduates. Source: Brigham Young University & Normal Training School, Catalogue & Announcements, for 33rd Academic Year, 1908-1909, pp. 128-130. Brigham Young High School, Class of 1908. Matilda Anderson of Fairview, Utah. She received a Normal Diploma. Source: Students Record of Class Standings B.Y. Academy, Book 2, Page 3. ~ ~ ~ ~ BYH Class of 1908. Matilda Anderson, a Normal graduate. BYU [& BYH] Class of 1908 Listing of BYH Normal, High School, Commercial, Music, Agriculture, and Arts & Trades graduates. Source: Brigham Young University & Normal Training School, Catalogue & Announcements, for 33rd Academic Year, 1908-1909, pp. 128-130. Brigham Young High School Graduate, Class of 1908. Albert J. Ashman [incorrectly listed as Ashmond]. Source: 1908 BYH Commencement Program. ~ ~ ~ ~ BYH Class of 1908. A. J. Ashman, a Normal graduate. BYU [& BYH] Class of 1908 Listing of BYH Normal, High School, Commercial, Music, Agriculture, and Arts & Trades graduates. Source: Brigham Young University & Normal Training School, Catalogue & Announcements, for 33rd Academic Year, 1908-1909, pp. 128-130. Brigham Young High School, Class of 1908. Samuel Baird of Kanab, Utah. He received a High School Diploma and a Normal Diploma. Source 1: Students Record of Class Standings B.Y. Academy, Book 2, Page 222. ~ ~ ~ ~ Source 2: Samuel Baird. 1908 BYH Commencement Program. ~ ~ ~ ~ BYH Class of 1908. Samuel Baird, a Normal graduate. BYU [& BYH] Class of 1908 Listing of BYH Normal, High School, Commercial, Music, Agriculture, and Arts & Trades graduates. Source: Brigham Young University & Normal Training School, Catalogue & Announcements, for 33rd Academic Year, 1908-1909, pp. 128-130. ~ ~ ~ ~ Collegiate Grad of BYU, Class of 1912. Samuel Baird. He received a B.A. Degree in 1912. Source: Annual Record, B.Y. University, Book 4, page 385. Class of 1908. Rosetta Becker [not Backer] of St. John, Kansas. ~ ~ ~ ~ BYH Class of 1908. Rosetta Baker, a Normal graduate. BYU [& BYH] Class of 1908 Listing of BYH Normal, High School, Commercial, Music, Agriculture, and Arts & Trades graduates. Source: Brigham Young University & Normal Training School, Catalogue & Announcements, for 33rd Academic Year, 1908-1909, pp. 128-130. ~ ~ ~ ~ Rosetta Victoria Baker was born November 30, 1886 in St. John, Stafford County, Kansas. Her parents were George Washington Baker and Annary Victoria Hayes Baker. Rosetta married Loren Jesse Robinson on June 14, 1911 in Salt Lake City, Utah. Rosetta Robinson died on January 6, 1983 in Salt Lake City, Utah. Her interment, Oakley, Idaho. ~ ~ ~ ~ Her age in May of 1908: 21. Class of 1908. Emma Bayles of Bluff, Utah. ~ ~ ~ ~ BYH Class of 1908. Emma Bayles, a Normal graduate. BYU [& BYH] Class of 1908 Listing of BYH Normal, High School, Commercial, Music, Agriculture, and Arts & Trades graduates. Source: Brigham Young University & Normal Training School, Catalogue & Announcements, for 33rd Academic Year, 1908-1909, pp. 128-130. ~ ~ ~ ~ Emma Juliette [or Juliet] Bayles was born on November 23, 1885 in Bluff, San Juan County, Utah. Her parents were Hanson Bayles and Mary Ann Durham Bayles. Emma died on November 2, 1957 in Salt Lake City, Utah. Her interment, Salt Lake City, Utah. Apparently she did not marry. ~ ~ ~ ~ Her age in May of 1908: 22. Brigham Young High School, Class of 1908. Margaret A. Bean of Provo, Utah. She received a Normal Diploma. Source 1: Students Record of Class Standings B.Y. Academy, Book 2, Page 224. ~ ~ ~ ~ Source 2: Margaret A. Bean. 1908 BYH Commencement Program. ~ ~ ~ ~ BYH Class of 1908. Margaret Bean, a Normal graduate. BYU [& BYH] Class of 1908 Listing of BYH Normal, High School, Commercial, Music, Agriculture, and Arts & Trades graduates. Source: Brigham Young University & Normal Training School, Catalogue & Announcements, for 33rd Academic Year, 1908-1909, pp. 128-130. Collegiate Grad of BYU, Class of 1926. Reid Beck. He received a BS Degree in 1926. Source: Annual Record, B.Y. University, Book 3, page 142. ~ ~ ~ ~ BYH Class of 1908. Reid Beck, a Normal graduate. BYU [& BYH] Class of 1908 Listing of BYH Normal, High School, Commercial, Music, Agriculture, and Arts & Trades graduates. Source: Brigham Young University & Normal Training School, Catalogue & Announcements, for 33rd Academic Year, 1908-1909, pp. 128-130. Brigham Young High School, Class of 1908. Erasmus Borquist. He received a High School Diploma. Source: Students Record of Class Standings B.Y. Academy, Book 2, Page 226. ~ ~ ~ ~ Source 2: Erasmus Borgquist. 1908 BYH Commencement Program. Brigham Young High School, Class of 1908. Jonathan E. Bowen. He received a High School Diploma. Source 1: Annual Record, B.Y. University (BYU Records Office), Book 3, Page 158. ~ ~ ~ ~ Source 2: John E. Bowen. 1908 BYH Commencement Program. Brigham Young High School, Class of 1906 and 1908. Fay Brimhall of Provo, Utah. In 1906 she also received a Certificate in Elocution. Source: Students Record of Class Standings B.Y. Academy, Book 2, Page 226. ~ ~ ~ ~ Brigham Young High School, Class of 1908. Fay Brimhall. She received a Normal Diploma. Source: Students Record of Class Standings B.Y. Academy, Book 2, Page 226. ~ ~ ~ ~ BYH Class of 1908. Fay Brimhall, a Normal graduate. BYU [& BYH] Class of 1908 Listing of BYH Normal, High School, Commercial, Music, Agriculture, and Arts & Trades graduates. Source: Brigham Young University & Normal Training School, Catalogue & Announcements, for 33rd Academic Year, 1908-1909, pp. 128-130. Brigham Young High School Graduate, Class of 1908. J. Archie Brockbank of Spanish Fork, Utah. Source: 1908 BYH Commencement Program. ~ ~ ~ ~ Collegiate Grad of BYU, Class of 1916. J. Archie Brockbank. He received an AB Degree in 1916. Source: Annual Record, B.Y. University, Book 3, page 160. ~ ~ ~ ~ BYH Class of 1908. J. Archie Brockbank, a Normal graduate. BYU [& BYH] Class of 1908 Listing of BYH Normal, High School, Commercial, Music, Agriculture, and Arts & Trades graduates. Source: Brigham Young University & Normal Training School, Catalogue & Announcements, for 33rd Academic Year, 1908-1909, pp. 128-130. Brigham Young High School, Class of 1908. Lorena K. Chipman of American Fork, Utah. She received a Normal Diploma. Source 1: Students Record of Class Standings B.Y. Academy, Book 2, Page 229. ~ ~ ~ ~ Source 2: Lorena Chipman. 1908 BYH Commencement Program. ~ ~ ~ ~ BYH Class of 1908. Lorena Chipman, a Normal graduate. BYU [& BYH] Class of 1908 Listing of BYH Normal, High School, Commercial, Music, Agriculture, and Arts & Trades graduates. Source: Brigham Young University & Normal Training School, Catalogue & Announcements, for 33rd Academic Year, 1908-1909, pp. 128-130. Brigham Young High School, Class of 1908. John S. Christensen. He received an Agriculture Diploma. Source 1: Students Record of Class Standings B.Y. Academy, Book 2, Page 75. ~ ~ ~ ~ Source 2: John S. Christensen. 1908 BYH Commencement Program. BYH Class of 1908. Hannah Condie, a Normal graduate. BYU [& BYH] Class of 1908 Listing of BYH Normal, High School, Commercial, Music, Agriculture, and Arts & Trades graduates. Source: Brigham Young University & Normal Training School, Catalogue & Announcements, for 33rd Academic Year, 1908-1909, pp. 128-130. Brigham Young High School, Class of 1908. Heber Cottam. He received a High School Diploma. Source 1: Annual Record, B.Y. University (BYU Records Office), Book 3, Page 185. ~ ~ ~ ~ Source 2: Heber Cottam. 1908 BYH Commencement Program. 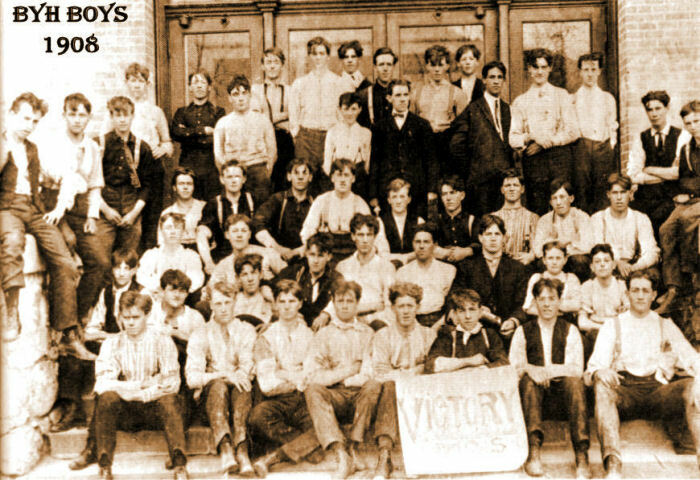 B. Y. Academy High School, Class of 1901 and 1908. Mary A. Cropper. In 1901 she received a Special Certificate in Drawing. Source: Students Record of Class Standings B. Y. Academy, Book 1, page 188. ~ ~ ~ ~ Brigham Young High School, Class of 1908. Mary A. Cropper received a Normal Diploma. Source: Students Record of Class Standings B.Y. Academy, Book 2, Page 77. ~ ~ ~ ~ BYH Class of 1908. Mary Cropper, a Normal graduate. BYU [& BYH] Class of 1908 Listing of BYH Normal, High School, Commercial, Music, Agriculture, and Arts & Trades graduates. Source: Brigham Young University & Normal Training School, Catalogue & Announcements, for 33rd Academic Year, 1908-1909, pp. 128-130. Her parents: Thomas Waters Cropper and Hannah Lucretia Cropper. Mary was born September 19, 1884, at Deseret, Millard County, Utah Territory. Her siblings: Georgiana Johnson; Hannah Cropper; Sabrina Land Cropper; Eda Elizabeth Tippetts and Lyle Pratt. Mary Amelia Cropper married Arthur Henry Reeve. Mary died on September 2, 1966 in Delta, Millard County, Utah. Her interment, Fillmore, Millard County, Utah. Arthur died July 5, 1979 in Brigham City, Box Elder County, Utah. His interment, Fillmore, Millard County, Utah. BYH Class of 1908. Horace E. Day, a Normal graduate. BYU [& BYH] Class of 1908 Listing of BYH Normal, High School, Commercial, Music, Agriculture, and Arts & Trades graduates. Source: Brigham Young University & Normal Training School, Catalogue & Announcements, for 33rd Academic Year, 1908-1909, pp. 128-130. Brigham Young High School, Class of 1908. Veda Dixon. She received a High School Diploma. Source 1: Students Record of Class Standings B.Y. Academy, Book 2, Page 234. ~ ~ ~ ~ Source 2: Veda Dixon. 1908 BYH Commencement Program. ~ ~ ~ ~ Her hometown is Payson, Utah. After graduating from Brigham Young High School in 1908, she attended the A.C.U. at Logan, Utah. She graduated from the A.C. in May of 1910 in Domestic Sciences. Graduates of the A. C. ~ ~ ~ ~ Veda Dixon was born May 23, 1888 in Payson, Utah Territory. Her parents were Christopher Flintoff Dixon and Lodasca Richmond Dixon. Veda married Lloyd Herbert Hamren on June 5, 1912. Lloyd was born November 3, 1886 in Center, Wapello County, Iowa. His parents were Charles M. Hamren and Minerva W. Hamren. Lloyd died on August 23, 1975 in Los Angeles, California. Veda Dixon Hamren had died 13 years before on November 22, 1962 in Los Angeles, California. Brigham Young High School, Class of 1908. S. Bernul Eggertson [actually Simon Bernard Eggertsen]. He received a High School Diploma. Source 1: Students Record of Class Standings B.Y. Academy, Book 2, Page 208. ~ ~ ~ ~ Source 2: Bernard S. Eggertsen. 1908 BYH Commencement Program. ~ ~ ~ ~ Simon Bernard Eggertsen was born on January 6, 1888 in Utah. S. B. Eggertsen died on October 31, 1969 in Salt Lake City, Utah. His interment, Salt Lake City Cemetery, Utah.